This photo was taken on October 17, 2016 at 4:32 PM. The location was in the courtyard like drive way of a very nice hotel in Old Towne Alexandria, Virginia. The "Take It!" came as I was departing from this hotel in my car, and happened to look upward through the windshield. 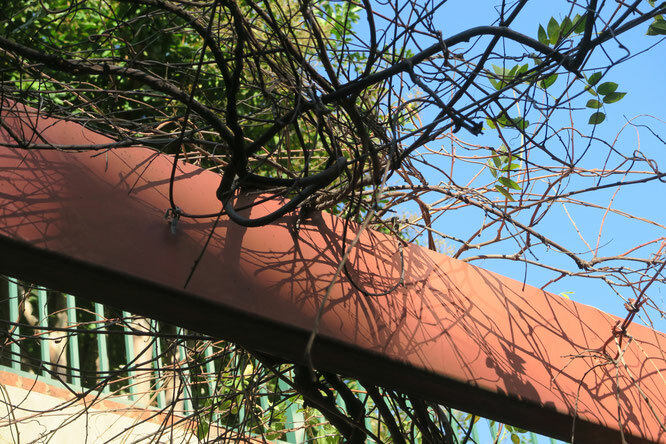 The time of day just happened to bring about the casting of a shadow from the now leafless vine structure that has been carefully nurtured over the years, to provide shade in the spring and summer over this area that has lots of heat absorbing concrete on the surface below it. The need for the sun heat relief has gone as temperatures drop, and the leaves are falling from almost everything. Its annual task having been fulfilled, it now goes into winter mode, which includes being a shadow caster for which we have an appreciative eye. The After Take: To those I have shown this to, all seem to enjoy it. There are quite a few things going on in this photo, which include the angle of the beam which lucky for me, just happens to make its way from one side of the photo to the other at a pleasing angle. The dab of intensely blue sky offers great color contrast (as it almost always does). What this has shown me, is that for ever so many years, I have looked at many a trellis, and the plant for which it is the host with not much of a second glance when the season changes and its foliage has gone. This has all changed, as with leaves gone, it gives us a chance to admire the handiwork of the skilled gardener charged with making certain these are the ever so appreciated performers of summer. Here is to the gardeners in our world - A big thanks, your work makes our lives easier, in many ways. Wishing each of you a similar moment when the sun aligns to bring not only a neat shadow, but also a reflection that is all internal, and savored. Yep, its that time of year. Good luck everyone, lol. If that shadow work was intentional here, great work. They cast a messy array, almost like a cobweb or something of the like. The actual trellis and wiring give it kind of a nesting look, like how birds sort of throw things in to create their home. We had fun with this one at our lunch. As always thanks for the entertainment! While I prefer trees when they are in full bloom I have no problem during these months when they are bare. I get both in this picture!!! At first I didn't notice the tree in the background, but after looking for a few seconds I saw it.